Can you believe these awful animal accessories? I’m sure in our lifetime we’ve all seen some pretty crazy animal accessories. Personally, I strongly dislike all animal accessories. But if you want to dress your dog in an elf costume and push it in a pram, and give your hamster a tutu, that’s fine. If you aren’t harming or endangering your pet in any way, then I don’t have a problem with it. Animal cruelty on the other hand, is something I’m strongly against. You should know this article isn’t about the fairy dogs, or the kittens in hats, this article is discussing accessories much worse than any accessories you’ve ever seen, worse than the cheap rings you get in crackers, that go on but never come off, and worse than the stainless silver that turns your skin green. These too might turn your skin green, but for a different reason altogether. When I first heard about these accessories, my mouth literally hung open in disbelief. It will sicken you. It sickened me. 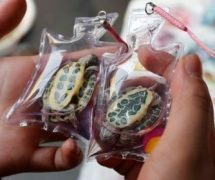 If you have ever been enraged by animals confined in tiny cages (much too small for them) in pet stores or at zoos, you will definitely not be impressed by China’s new sickening souvenir scheme. In China a recent craze has broken out, which takes animal cruelty to a whole new level. 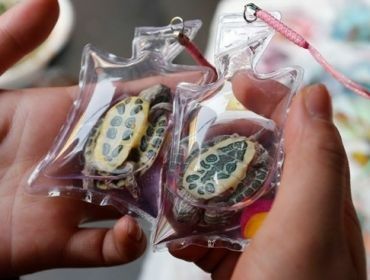 At first glance this appears to be some sick joke, but as I did further research regarding the topic, these animal key rings seem to be a fast selling thing in China. I kid you not, people in China (street traders) are selling live amphibians in mini plastic bags for less than a pound. They call these pouched creatures “Lucky Charms”. 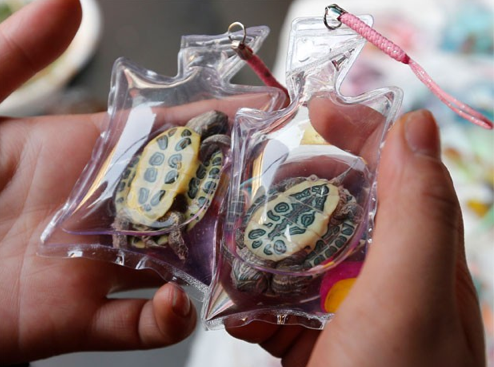 Turtles, fish, lizards and millions of creatures alike are becoming China’s newest merchandise. The vendors claim that these miniature see-through bags, in which the creatures are trapped, have crystallised oxygen and other necessary nutrients in order for the creatures to survive. I highly doubt the creatures stay alive much longer than a day of two in those bags, before inevitably dying of oxygen deprivation. But surely that’s beside the point. There is no room for movement inside these plastic key chains. These creatures are being trapped in plastic bags, and sold just to be flung onto a batch of keys, and treated without care, like all good loyal key rings. Animals deserve much kinder treatment than that. I think it’s absolutely disgusting. Key rings are a good for nothing item, that everyone loves collecting, that everyone has, but rarely anybody gives much care to, they’re there to serve their purpose and to identify your keys, keeping them all in one place, nothing more. A key ring is in no way a fit home for any creature. The whole craze is simply appalling. And the fact that local laws mean that selling these items is completely legal, infuriates me and many others. Many animal rights advocates have expressed their complete and utter disapproval by signing a petition, which can be found at AVAAZ.org. It has already gathered over 143,000 signatures in hope of stopping the sale of these animal key rings. I – for one – want this craze to stop. The creation and sale of these key rings, is absolutely awful. They take animal cruelty to another level, and if that isn’t enough to make you mad at the people who get away with this sort of retail, there are also human health risks involved by being that close to dying animals, such as turtles that often carry bacteria such as salmonella. Currently China has no animal cruelty laws, personally I think something needs to be done about that. This article sums up my rage as I think about the animal cruelty that happens globally. I hope you too have been somewhat effected by the discovery of the ill treatment of the key ring pets.